In the early hours of this morning something quite extraordinary happened in the skies which will only occur again in 2033: a “supermoon” in a total lunar eclipse. What’s needed for this to happen and why is it so rare? First, the moon has to be a full moon. Second, the full moon has to be at its closest point to the earth. The moon travels in an elliptical path round the earth and has both perigee, closest, and apogee, farthest, points. The closest the moon gets to the earth is 225,804 miles (363,396 km) at the perigee and the farthest 251,968 miles (405,504 km) at the apogee… That’s a difference of 25,000 miles. No wonder that at its perigee the moon looks almost a third larger! Third, there has to be a lunar eclipse. This means that earth is exactly aligned in the middle between the moon and the sun. A blocked-out moon does not occur here for the sun’s rays can penetrate the moon’s shadow and create a rusty red colour much in the same way that sunsets and sunrises are reddish since the other colours in the spectrum are scattered away. A blood moon has intimations of prophecy. It may, in the minds of some, forecast the end of the world. In the Bible’s book of Joel, for example it is written: “the sun will turn into darkness, and the moon into blood, before the great and terrible day of the Lord comes”. This year signals (for a few) the end of the world for some time to come (if that isn’t an oxymoron!) 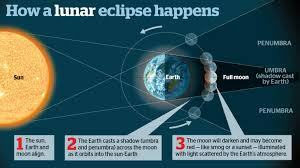 since there have been a series of four consecutive lunar eclipses which coincide with six full moons in between, with no partial lunar eclipses and all coinciding with Jewish holidays. The technical term for this is a tetrad. Strangely I did wake up at around three (Italian time) in the morning to witness the lunar eclipse. I’m sure that those with more powerful cameras and telescopes will have produced some dazzlingly red pictures. I was only able to come up with the following however. 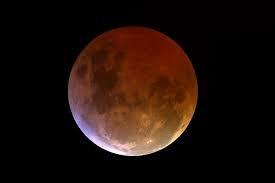 But you can still see the first phase of the eclipse and the spreading of a reddish glow over the moon’s surface. and wrap in silence cold earth’s sounds. that beats against forbidden walls? from something vast that never palls? cast up in folds high on the pass. and hears a music still unheard. my sister comes both near and far. When very young and on an autumns twilight in Lewisham Park London, I remember being scared by the vision of a red moon rising above the poplars. My brother and mother were with me and they said it was a strange apparition but nothing to worry about. Let’s hope that this time round, even with the supermoon, there’s still nothing to worry about! A spectacular walk in this area which still remains at grade E (no ropes or special equipment needed) is one which starts with footpath no 41 at Tecchia, a lonely shepherd’s hut. 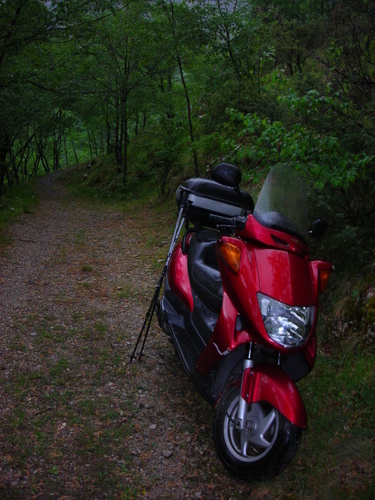 Tecchia can be reached from Castelnuovo di Garfagnana by following the road towards Arni. The route crosses the main ridge of the Apuans through the “Del vestito” tunnel and then starts descending towards the Tyrrhenian Sea. 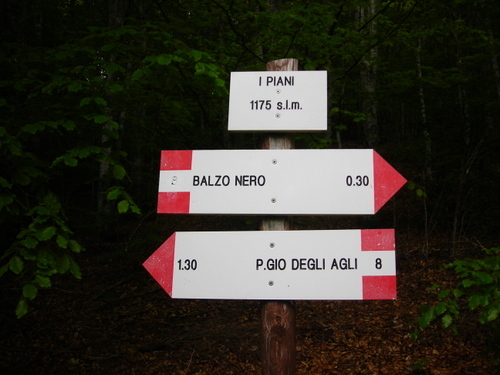 As soon as the sign saying” Orto Botannico Pellegrini “ (itself, an interesting mountain botannical garden to visit) is sighted then one is near the start of the footpath. The car park is rather small so an early start is recommended! 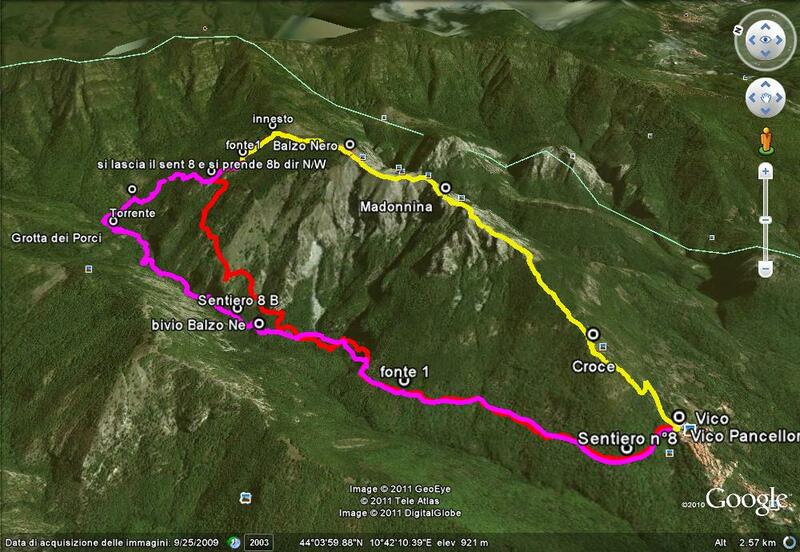 The walk begins at a height of 2696 feet and climbs up steadily reaching the Foce Del Frate at 4347 feet. From this point footpath no 41 is left for footpath no 143 which coasts the second gothic line with its bunkers and relics of the final front of the supposedly invincible Wehrmacht. 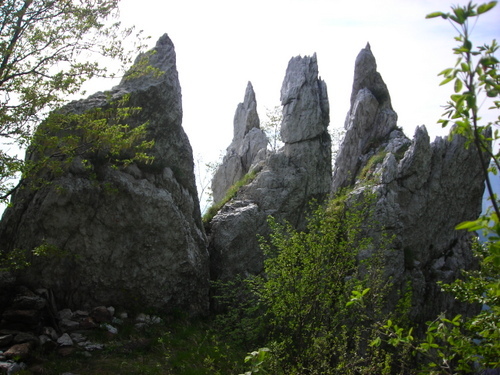 The passo degli uncini, at 4527 feet, translated mean the pass of the hooks and the weird shape of the rocks at its summit do, indeed, remind one of monolithic hooks. 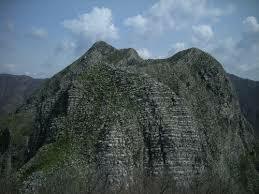 There is also a formation of rocks appropriately called “Il tridente”. The descent from the passo degli uncini is incredibly steep but negotiable without any equipment. It eventually joins up with footpath no 188 which takes one back to Tecchia. The photographs of this walk date back to May 2007. For any reasonably fit person it shouldn’t take more than five hours to do the walk (which is not recommended to those suffering from vertigo, I hasten to add). The walk is definitely one of the most stunning I’ve done and the views towards the sea are quite stratospheric! The Merry Month of May has Arrived! Sweet Peg, thou shalt be my Summer’s Queen. The weather on the first of May this year wasn’t quite as merry as the month is supposed to be. A light soft rain at frequent intervals meant it was definitely a part-time umbrella day. This, however, did not deter us from celebrating the start of May which, in the Roman Catholic calendar is dedicated to the Virgin Mary. 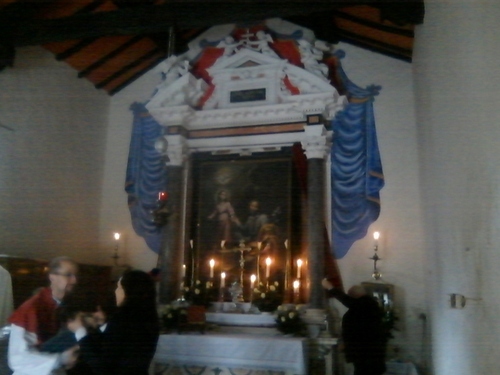 The day started with a visit to the chapel of Saint Joseph which is the one you pass on the road just after Gombereto. It’s very rarely open for business so we were glad to find that there was a Mass celebrated on Saint Joseph’s day which falls on May 1st. The chapel is in good condition apart from some damp on the walls and is now approached by a highway of a footpath to replace the old gravel one which was washed away. On the altar is an excellent copy of a beautiful painting by Murillo showing the young Jesus with his dad. If you’re a Londoner and think you’ve seen the original somewhere there then you’re right. The original is called “The Two Trinities”, dates from around 1680 and is in the National Gallery. The Gombereto copy omits the Virgin and the Trinity to concentrate on Saint Joseph, to whom, after all, the chapel is dedicated. Murillo is one of those painters whose reputation, like, for example, Guido Reni, has suffered since the nineteenth century. His pictures have now been deemed to be too often sentimental and cloying. Yet the Spanish painter’s life was quite other than gentle. His parents died when he was just nine and Murillo outlived his wife and all but three of his nine children. He lived through a particularly war-torn period of Spanish history and died as a result of falling off scaffolding while working on a painting for Cadiz’s Capuchin church. 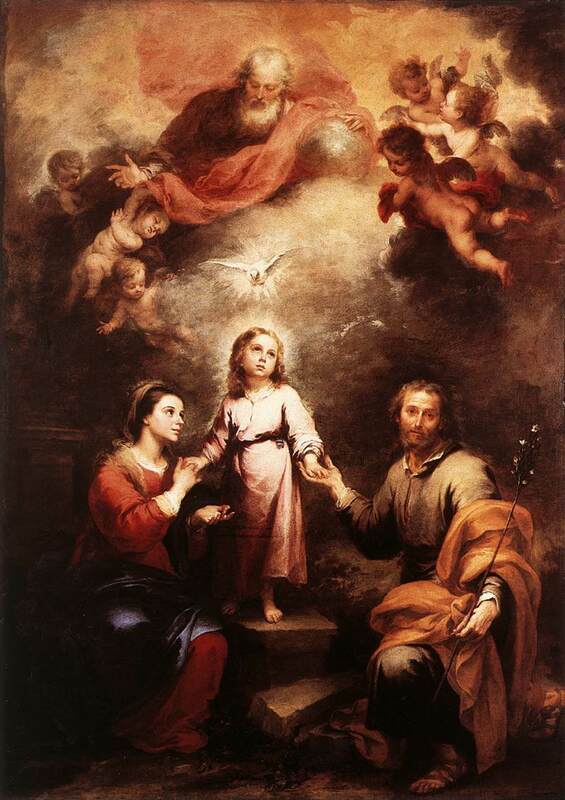 Gombereto’s’ copy fails to appreciate the original triangular composition which compares the heavenly trinity of God, Christ and the Holy Ghost with the earthly one of Mary, Joseph and the child Jesus. It still, however, includes the flowering rod in Joseph’s hand showing that he had been chosen to be Jesus’ dad. Jesus is shown on a stone illustrating the passage from Isiah: ‘thus saith the Lord God, Behold, I lay in Zion…a precious corner stone, a sure foundation’. From the sacred to the secular, as usually occurs in Italy, is but a short step and we enjoyed a pleasant afternoon at Fornaci di Barga’s first of May celebrations, an event which goes back many years. The high street was mercifully closed to through traffic and there were plenty of stalls especially selling flowers. We concentrated on cabbages and zucchini for our allotment, however. 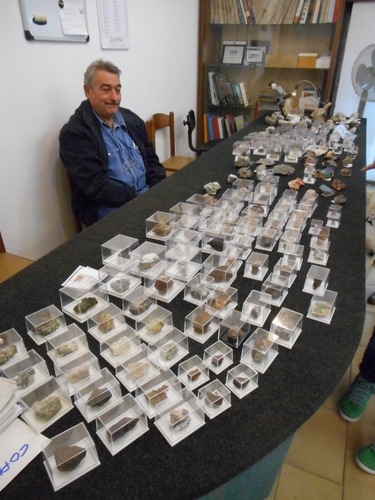 That luminary in the geological field, Marco Barsanti, opened up his association’s marvellous collection of fossils and minerals to the public. I’ve already posted this under-publicised museum at https://longoio.wordpress.com/2013/11/29/the-earth-at-our-feet/. There were plenty of specimens for sale to the general public, no doubt extracted with the greatest care and effort from mother Earth. Rain certainly didn’t stop us from enjoying the first of May and we look forwards to the ever-abundant cornucopia of events which the start of May kicks off and which continues throughout summer in Lucca province and most other places in festive Italy. For a start, thinking on a international scale, have you booked your ticket for Milan’s and the world’s “Expo 2015” yet? Already ten million tickets have been booked, (two of which are ours!). My neighbour doesn’t seem to be the type to go mad so I checked up on the web and found that there had indeed been an earthquake – in fact, several shocks. On the same day that marked the thirtieth anniversary of our last major earthquake warning the people of Garfagnana and Mediavalle (where we are) experienced an unwelcomed wake-up call. From 3.20 am with an epicentre in the Emilian- Tuscan Apennines there have been over 25 seismic shocks. At 5.27 the first shock to be higher than magnitude 2.5 (at 3.2) was registered. At 7.51 am the biggest shock was felt with magnitude 4.1 and with a lesser one at 8.03 am at magnitude 3.2. 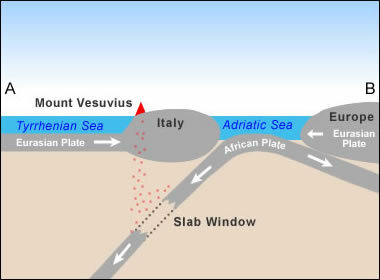 The epicentre was localized at a depth of 9 kilometres in the Pistoia region near Castiglione dei Pepoli, Camugnano and Vermio. The Mediavalle area felt the earthquake only because of the seismic waves reaching it. So there we are: earthquakes are getting more frequent over here. Why? It’s because the African tectonic plate is squeezing ever more against the tectonic plate on which Italy is placed. So not only is this country being invaded by refugees crossing the seas from Africa but also by geological phenomena from the same place. What about the anniversary the newspaper mentioned? In 1985 there was a major earthquake alert after a number of smaller tremors. The Lucca authorities organized the evacuation of 100,000 persons from their houses in the Garfagnana region. Fortunately, the big one did not happen and everyone returned to their homes after a couple of days. We are, however, expecting the “big one” at any time since, according to records, it tends occur every hundred years and the last one was in 1920 (See my post at https://longoio2.wordpress.com/2014/09/30/the-big-one/ on that one). Type of seismic waves hitting one: lateral – vertical – undulating – all these waves of the same intensity will produce different effects. Type of building construction. Very modern anti-seismic buildings or (interestingly) older buildings (because of their flexibility – especially if there is a lot of wood or old stone) will withstand earthquakes with less damage. Buildings most at risk are those standard reinforced concrete or breeze block ones built in the sixties and seventies. Physical state of person. Many victims of earthquakes are caused through heart attacks and the like. It’s clear that physically and mentally fitter people will be able to survive better. Finally, as President F. D. Roosevelt famously said “The only thing we have to fear is fear itself”. So “what me worry?” There are plenty of things that can finish one off sooner than a major earthquake and I won’t’ even start to name them here! Apart from its Rocca and its Duomo, Castelnuovo di Garfagnana, sometimes called the “capital of the Garfagnana”, is a disappointing place to visit unless one needs to do some last minute shopping. Much of this has to do with the fact that, as a nodal point in the allied advance during WWII, it was severely bombed (though not as badly as Aulla further up north in the Lunigiana which was completely flattened). For more information and photographs about war damage to Castelnuovo di Garfagnana see my post at http://longoio.wordpress.com/2013/04/09/vecchio-castel-nuovo-and-the-fury-of-war/. Castelnuovo is a straggly sort of place without a true sense of being a centre in its own right. For that sense, and for a true feeling of civic togetherness, one has to go a little further north to Pieve Fosciana. With its semi-grid plan, narrow side alleys, noble palaces and a treasured church, Pieve Fosciana, although breathing an atmosphere of some neglect and having been in WWII’s front line for seven months, remains largely intact and is a place to linger in. 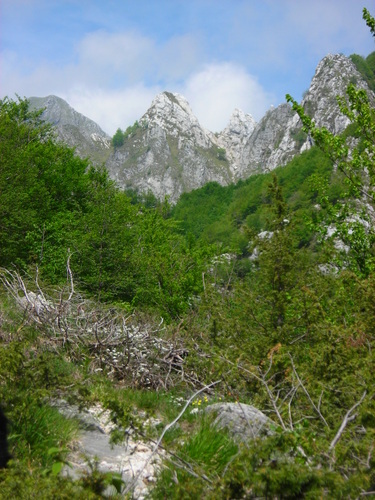 Regarding the origins of Pieve Fosciana, the area retains prehistoric traces dating from the Neolithic period. The place name probably derives from an ancient parish church which administered the community and a centurion called Fustianus. The birth of the church, like all churches of Lucca province, is shrouded in mystery but old manuscripts in Lucca, indicate that may have been founded by Bishop San Frediano in the sixth century. The first permanent settlements in the area of Pieve Fosciana date back to Roman times, as evidenced by archaeological finds. 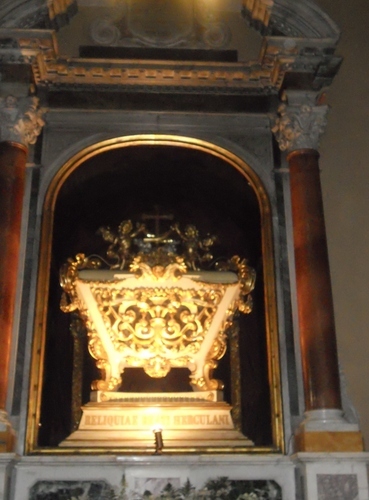 Pieve Fosciana is famous for being the burial place of the blessed Ercolano Piegaio, a Franciscan preacher of the fifteenth century. The Blessed Ercolano received the authorization to establish religious communities in Garfagnana from Pope Eugenius and founded two monasteries dedicated to St Francis, one near Barga (where the hospital is – see my post at https://longoio.wordpress.com/2013/05/09/heavenly-hospitals/) and another in Pieve Fosciana. Surrounded by the fame of holiness, Ercolano died in 1451 in the convent of San Francesco. After this convent was demolished in the nineteenth century Ercolano’s relics were translated to the Pieve where they can still be viewed and worshipped. Buildings of interest include the Pieve di San Giovanni Battista and the old mill, described in my previous post at https://longoio2.wordpress.com/2014/09/09/there-is-a-mill-an-ancient-one/ which has belonged to the Regoli family for five generations. Pieve Fosciana also has a small thermal area where one can bathe in hot waters which are considered excellent for alleviating rheumatism and other physical ailments. The thermal lake of Pra di Lama is a small lake where a few ducks nest and swim. It is fed by several springs, which emerge from volcanic strata, rather like those of Bagni di Lucca. The lake appears to have no particular abnormalities, but its geological situation is far from stable. Sometimes the lake level is suddenly lowered. Immediately afterwards an eruption occurs that pours large amounts of muddy water into the Serchio,discolouring it for several kilometres. The lake’s banks may collapse, its waters engulfing the surrounding fields, and quick sands may appear which have swallowed several people. The origin of Lake Pra di Lama is quite recent. In 1826 in place of the lake there was a meadow, in the centre of which, over an abundant thermal spring, a hut was built where people bathed for therapeutic purposes. Within a few months, the hut was swallowed into the earth leaving only a small pool of water. At 11 am on August 15, 1828 a loud explosion startled the local inhabitants, and at the base of the hill there arose a great amount of muddy water blasted into the air along with a pestilential miasma that caused a serious epidemic striking at least two-thirds of the population for years and causing a marked increase in mortality. On that occasion a pond forty feet wide and eleven feet deep was formed but in 1842 it had almost completely disappeared. Between February and March of the following year a new soil movement and the birth of ten other thermal sources expanded the lake again, and the Serchio was stained by mud for twenty kilometres up to Borgo a Mozzano. Again, in Pieve Fosciana and the surrounding areas deaths dramatically increased from diseases caused by the inhalation of the lake’s poisonous vapours. A century later, at the end of World War Two, the lake was reduced to a small pond which locals attempted to reclaim by filling it with rubble and waste. However, new eruptions occurred, enlarging the lake again. In the following years facilities for bathing with changing rooms and baths were built. Those using the facilities increased. This situation lasted until the early nineteen seventies when the lake sprang to life again, swallowing trees up to a height of ten metres so that only the tops were visible and bringing down most of the buildings constructed for the thermal baths. In March of 1996 the lake again erupted, before suddenly dropping down about two metres. (Fortunately it’s over a hundred years since one last heard of epidemics and mysterious deaths around the lake, otherwise we may not have been here to write this). Meanwhile, chemists have established the excellent therapeutic qualities of the sulphurous lake water which is also radioactive. They include sulphate, sodium chloride with a fixed residue of 5.45 grams /per litre. The water’s temperature is 37 degrees C.
During our visit the thermal springs were being used by this gentleman. We tested the waters and found that, although they smelt of bad eggs, they were deliciously warm and relaxing. Near the lake was the rapidly ruining white elephant of the thermal establishment of Pieve Fosciana. This building, dating from the early 1980’s was meant to place Pieve Fosciana in the same league as other spas, like Montecatini, but financial mismanagement caused the project to flounder miserably. We thought of exploring the concrete monstrosity but were deterred by the danger of falling masonry. What a pity! Although geologists have apparently secured the safety of the lake by controlling its noxious vapours and avoiding the asphyxiation of visitors in search of its therapeutic qualities, the presence of the decaying concrete monster leads to a feeling of dejection around the place, typical of so many pie-in-the-sky projects in Italy which have never been finished and are left for the contemplation of the frustrated public. Water, Water Everywhere…and not a Drop to Drink? In the last century, when Bagni di Lucca had many more hotels than it has now, there was a hoteliers’ custom of providing sheltered bathing places by the river Lima very much like the “stabilimenti balneari” (bathing establishments) today provide deckchairs, changing rooms and showers in Viareggio, Forte dei Marmi and most other resorts. This local custom was discontinued some time ago and if one wants to bathe in the river Lima one has to do some exploration to find a suitable place to swim and cool off in the summer. This year wasn’t much of a summer to cool off in but I wanted to check out one of my favourite bathing places further upstream from Bagni di Lucca. Such places should always be kept secret so (unless you recognize it from the pictures) I won’t tell you exactly how to reach it. River bathing can be a delight once one gets used to the somewhat colder temperature of the water! The water is usually rather cleaner than that found in many seaside resorts and for company one has trout to swim with. Together with a picnic, a book and some sun cream, one could spend a day pleasantly by the Lima this way. The theme of rivers and water was brought up this week at a conference I attended in Vico Pancellorum organized by “Il Risveglio”, Vico’s energetic village association and presented by Aldo Baiocchi. The theme was “the importance of water to humans.” After Massimo Betti’s mayoral introduction, highlighting the fact that our borough doesn’t lack this resource, gives it generously to those outside its boundaries but is insufficiently compensated for this, Claudio Stefanini, the association’s president, gave a historical background to the distribution of water in Vico. Claudio Belli, international water engineer, spoke on maximising water in developing countries, particularly Somalia and Afghanistan, where he has worked. Belli stressed the fact that, when it comes to the distribution of water, it is important to understand the local culture which may create difficulties greater even than technical ones in any project. There was space to ask questions from the audience, in particular, on water management in our area. Is water a common good or a private one? Here, Napoleonic and Anglo-Saxon laws were compared. (In England, for example, what you find on your own property belongs to you and only a part is due to the state. In Italy, even if one discovers gold, everything belongs to the state). With regard to public fountains, I was shocked to realise that their bills are paid by the council (from money we pay them in terms of services) and not by the water company, Gaia. Two years ago, for example, the bills were so high that the council decided to shut many of the fountains. In my opinion, fountains should be a “common good” and be available free of charge to all, especially walkers who can slake their and their dog’s thirst while on a ramble. With regard to swimming pools (always a contentious subject in Tuscany) and water shortages it was confirmed that the pools are filled up from the main water supply and, once filled, only require some topping up annually since it’s essentially the same water circulating in them. Our area is lucky in the amount of water it has (perhaps somewhat unlucky this year in that it’s had too much of the stuff creating difficulties with extensive landslides and flooding throughout the territory). At the same time, minor water wars do exist here too (as I found out to my cost earlier this year) and confirmed independent supplies of water for agricultural or allotment use should always be sourced. With climate change, and the greater unpredictability this phenomenon is bringing to us, it is only sensible to avoid wastage, maximise rainwater supplies and conserve water stores in better managed and less leaky reservoirs.